Research in the Meek Lab aims to 1) determine the role of genetic diversity in population and ecosystem health and persistence, 2) elucidate the relationship between life history trait diversity and molecular diversity, 3) understand how natural and anthropogenic forces affect diversity and differentiation within and among populations, with the goal of improving our ability to conserve biodiversity, and 4) develop genetic tools to aid in the study, management, and conservation of species. Below are several key projects. Climate change poses a great threat to cold-water fish species. This is particularly true for lake dwelling cold-water fish as they are often limited in their capacity to disperse to avoid stressful conditions. Our ability to predict and plan for the effects of climate change is constrained by our understanding of the capacity of populations to adapt to changing conditions. This understanding requires knowledge of the genetic diversity and molecular mechanisms that underpin species’ ability to adapt. We are studying the effects differing climates have in shaping molecular responses to thermal stress in several distinct, but geographically close, populations of brook trout (Salvelinus fontinalis). Brook trout of eastern North America is a sentinel cold-water species, with decreasing suitable thermal habitat. 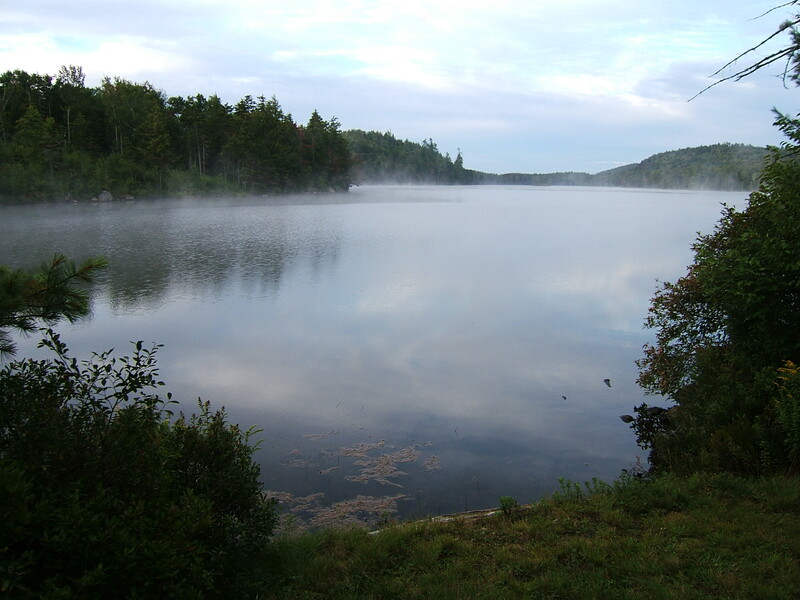 We are using a system of stratified and unstratified lakes as a natural climate change experiment, where the unstratified lake populations persist in thermally stressful conditions, while populations in stratified lakes have access to thermal refuge habitat at the bottom of the lakes. We are taking a genomic approach to address two questions: 1) Are there differences in gene expression among fish from different lakes and lake types (stratified vs. unstratified) in response to thermal stress, demonstrating local adaptation? and 2) Are there regions of the genome associated with differences in susceptibility and phenotypic response to thermal stress? We will be using this information to develop an approach for assessing the genetic diversity associated with thermal adaptation in other brook trout populations. 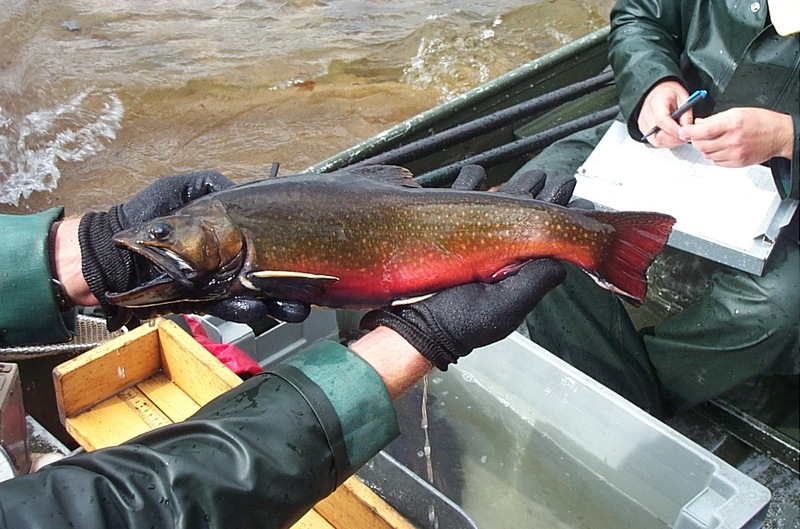 The information gained from this study will be invaluable for understanding the molecular basis for local adaptation and its relation to climate change resiliency planning, and in designing management actions that sustain brook trout and their habitats into the future. Collaborators on this project include Dr. Cliff Kraft and Dr. Matt Hare of Cornell University, and Nat Gillespie of the US Forest Service. Population structure of Central Valley Chinook salmon shown by discriminant analysis of principal components, using over 6,000 newly discovered SNPs. Colors tightly correspond with run timing: Light green = Late Fall run, Blue = Fall run, Orange = Winter run, Purple = Spring from Feather River Hatchery, Dark green = Spring from Mill and Deer Crs., Pink = Spring from Butte Cr. The Meek Lab is investigating the population genomics of the Endangered Species Act listed California Central Valley Chinook salmon (Oncorhynchus tshawytscha). We are using next-generation sequencing techniques (RAD-seq) to evaluate population structure within the Central Valley and to look for signatures of natural selection across the genome. Thus far, by taking a genome-wide approach, we’ve discovered over 12,000 new single nucleotide polymorphisms (SNPs) and show greater population structuring and genetic diversity in the Central Valley than previously identified. 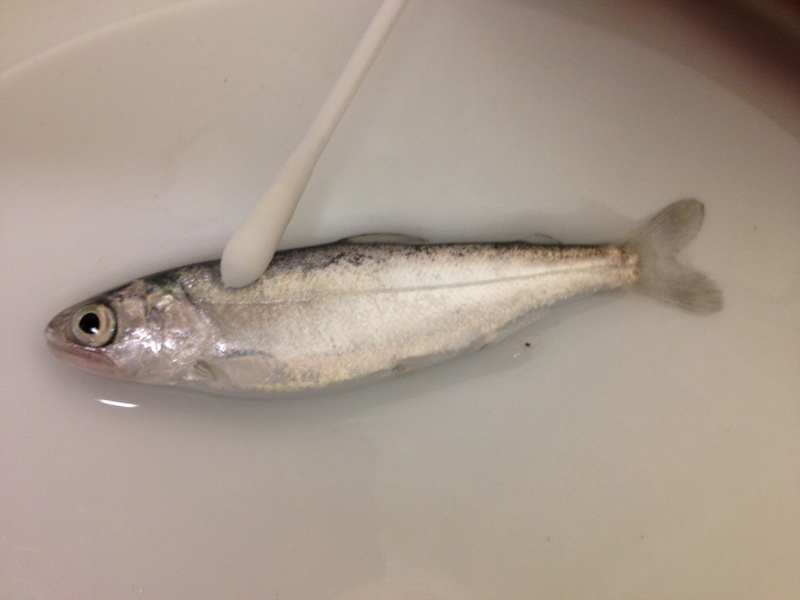 Additionally, we have developed an ancestry informative marker set of single nucleotide polymorphism (SNP) markers that improve our ability to distinguish between the various Chinook salmon run types and identify unknown individuals back to their source population (Meek et al. 2016). This work will improve our understanding of the genomic structure involved in adaptive variation among populations. It will be informative in the management of this imperiled species, including evaluating potential source populations for reintroduction efforts, genetic monitoring of populations in the face of climate change, and identifying juveniles to run type. Collaborators on this work include Drs. Bernie May, Melinda Baerwald, Molly Stephens, and Mike Miller at the University of California, Davis. Very little is known about how the runs of federally listed California Central Valley Chinook salmon differentially use habitat, yet this information is key to understanding how to target ecosystem restoration and conservation efforts. We are addressing this issue by applying molecular techniques to quantify the proportional use of flood plain and riverine habitat by juvenile Chinook in each of the spring, winter, fall, and late-fall runs. The Meek Lab is also investigating the natal origins of juveniles in floodplain and riverine habitat to determine if fish from different streams have different migration pathways. This information will aid our understanding of how different populations within the same species partition habitat in space and time, as well as allow managers to better direct restoration and conservation efforts to protect threatened populations and ecosystems. This work is taking place in the Sacramento River and Yolo Bypass floodplain. Collaborators on this project include scientists at the California Dept. of Water Resources. There are over 300 species in the United States that are listed as Critically Endangered under the IUCN Red List. These are the most imperiled populations we know of, yet there are many impediments to their conservation and protection, including large gaps in our understanding of how to protect them. In order to identify what the major data gaps are for the conservation of species on the verge of extinction, Dr. Meek organized a special interdisciplinary symposium and workshop on the topic (Check out this link to see recordings of all the great talks!). I collaborated with the workshop participants to collate the understanding gained from this workshop. The manuscript (Meek et al. 2015) outlines current impediments to the conservation of extremely small populations, as well as providing tangible solutions. 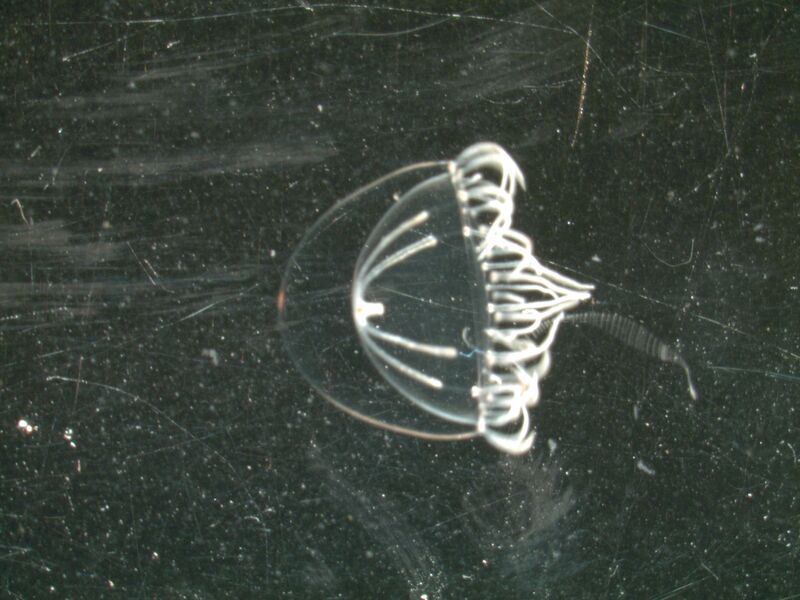 Maeotias marginata medusa. Photo from Dave (Gio) Giordano. 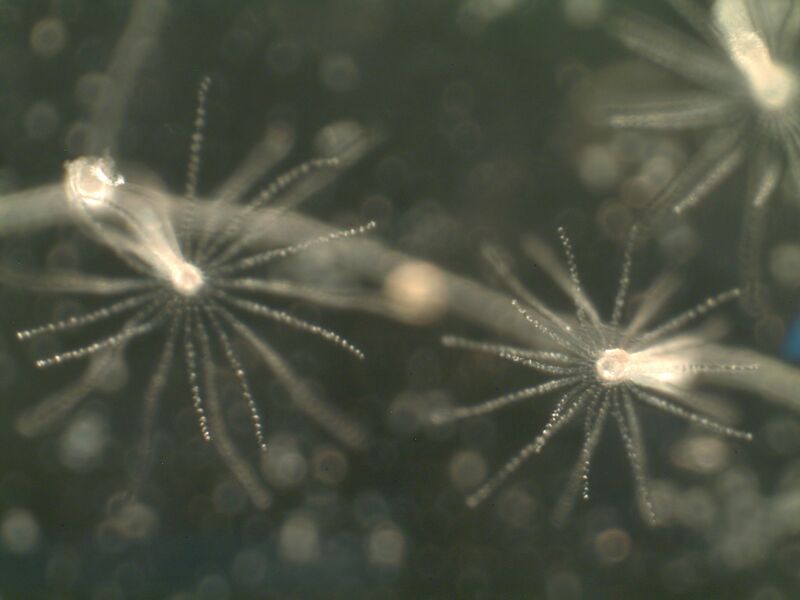 A suite of four predatory hydrozoan species (Maeotias marginata, Moerisia sp., Blackfordia virginica, and Cordylophora caspia) have invaded and become abundant in the San Francisco Estuary (SFE). 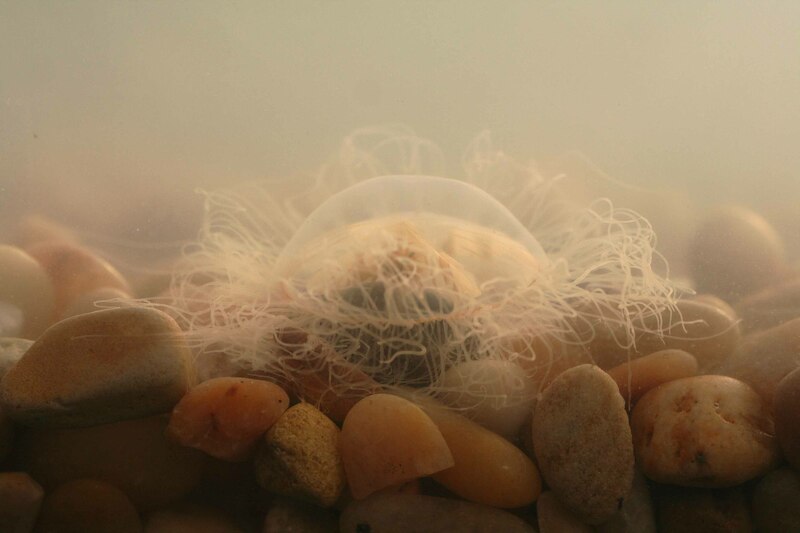 Our current level of knowledge regarding the basic biology and ecology of these organisms is alarmingly poor in light of both their possibly negative effect on the SFE ecosystem and the increasing trends in jellyfish blooms around the globe. Dr. Meek’s dissertation research sought to investigate the potential effects of these species on the SFE ecosystem (Wintzer et al. 2011), to determine the key factors allowing successful establishment and spread of these species (Meek et al. 2009, Meek et al. 2013, Wintzer et al. 2010, Wintzer et al. 2011), and to predict future spread of the invasions (Meek et al. 2012).